Smokejumper Heritage Tree seen in the background of a photo taken from the airport tarmac. 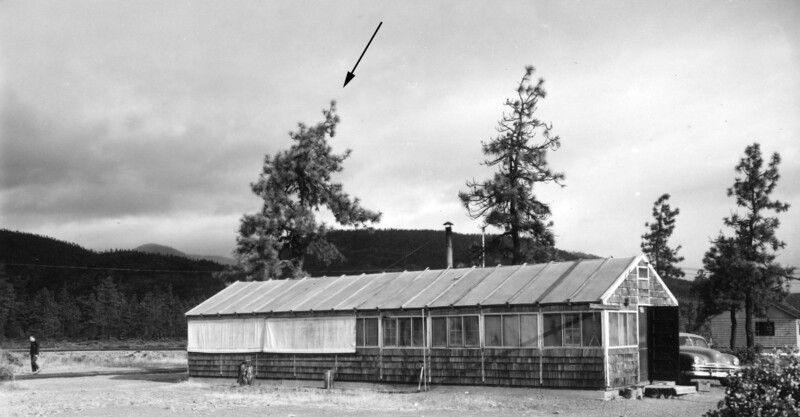 The new messhall, seen behind and to the left of the tree, was built in 1954 and destroyed by fire in 1962. The picture would have been taken within that time frame. This is a Jeffrey pine that was used as a living telephone pole for communications between the Forest Service headquarters in Cave Junction and the airport when smokejumper operations began in 1943. It illustrates the importance of trees in early communications. The Smokejumper Heritage Tree is registered in the Oregon State Heritage Tree Program. Four and a half miles south of Cave Junction on Highway 199 at the Smokejumper Museum. The tree is one of the features seen on the wheelchair accessible self-guided tour of the historic smokejumper base. From Interstate 5: Get off the freeway at Exit 55 (beginning of Highway 199) and travel about 30 miles to Cave Junction. Continue another four and a half miles past Cave Junction and look for the entrance sign for the Siskiyou Smokejumper Museum on the right immediately after the road opens into four lanes. Follow Smokejumper Way to the historic smokejumper base and look for the tree on the right. From Highway 101: From Crescent City, drive three miles north on Highway 101 and turn on to Highway 199. In about 35 miles you cross the Oregon border and five miles more you come to O’Brien, the first flashing yellow light you will see on Highway 199. Continue another three miles to where the road crosses the bridge over Rough & Ready Creek and widens into four lanes. Look for the entrance sign for the Siskiyou Smokejumper Museum on the left just before the road narrows from four to two lanes. There is no turning lane here so use caution for fast moving traffic behind you when slowing to make the turn. Follow Smokejumper Way to the historic smokejumper base and look for the heritage tree on the right. If you plan to fly in and visit the Smokejumper Heritage Tree the Siskiyou Smokejumper Museum or the 555th Parachute Infantry historic monument be aware that there are no food services at the airport. Camping is available but it is advised you bring food for evening meals. There is only one taxi in Cave Junction: Lil Green Taxi: 541 415-0535 (last updated June 2017).